Quail are mid-sized birds related to pheasants. There are many species, some of which are sometimes farmed, and some of which are considered game birds. Quail are usually eaten whole, including the bones, due to the small size of the bird. Quail are particularly eaten in French cuisine, Maltese cuisine, and Portuguese cuisine. There are also some Indian recipes for quail. Quail eggs are also popular. They are found in Chinese cuisine, Japanese cuisine (sometimes raw in sushi), and used in many dishes in Colombian cuisine. Harvested 35 days after hatching for tender and moist meat. Quail taste a bit sweeter than chicken. In past times, game was prepared for kings. Today, game meat is the answer to increasing demand for a better tasting, higher quality, and healthier food source. We have developed a much larger bird than the original Pharaoh quail by cross breeding and selecting only the best of every hatch for our layers. Preparation time for game is quick and allows chefs to be more creative. Our quail are genetically selected to ensure better flavor and consistent size. 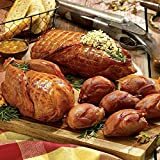 Game birds add mystique to any meal setting. All our quail eat a specially formulated well-balance feed that is 100% natural grain with NO added hormones and NO steroids to stimulate growth. Each quail are processed at an early age to ensure plump, tender, juicy birds. A state inspector is on the premises every slaughter day to ensure a quality job has been done. 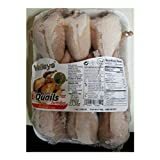 Vacuum tray pack containing 4 quail with each quail weighing approximately 4.5 to 5 oz. Our product line is focused around convenience and versatility. Our products offer something for everyone from caters, chefs, kitchen gourmets, or inexperienced cooks. Whether you are looking for a new menu item to increase revenue or just want to spice up any meal, "Plantation Quail" is the fresh idea everyone is looking for. All of our products are for those who desire gourmet flavor without high prices and time consuming preparations in the kitchen. 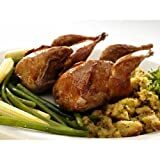 Any of our products can transform an everyday meal into an unforgettable dining experience.All whole quail products are bone-in (bones remaining). All the bones are removed except the wing and leg bone. Each quail are processed at an early age to ensure plump, tender, juicy birds and all the bones are removed except the wing and leg bones. This technique is done by hand, and every bird is inspected before packaging to ensure a quality product. A state inspector is on the premises every slaughter day to ensure a quality job has been done.